90 min [ The greatest fairy tale never told. ] - It ain't easy bein' green -- especially if you're a likable (albeit smelly) ogre named Shrek. 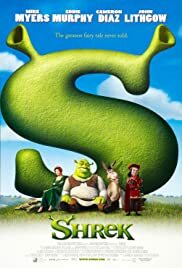 On a mission to retrieve a gorgeous princess from the clutches of a fire-breathing dragon, Shrek teams up with an unlikely compatriot -- a wisecracking donkey.